Thank you for the overwhelming response to our srt.phone. Here are a few announcements and updates that you might find useful. Customers who purchase the srt.phone before 11:59 PM on May 9th, will receive a FREE back cover worth INR 599, with Sachin Tendulkar’s signature. All you need to do is register onto the tronx app loaded within your phone and the cover is yours! All customers who purchase the srt.phone on or before 10th May are applicable to get the extended warranty upto one year worth INR 1499, absolutely FREE! A warranty letter along with the back covers will be shipped to your address upon purchase of the srt.phone. Can you please confirm the exact steps to register? The Tronx app is very unstable and can't talk to the underlying servers 98/100 times. It keeps saying username password not correct. BTW, I am not a novice user and using internet since 1999 and currently working as Solutions Architect in an investment bank. After numerous tries, I was able to login into the app but there is no option to register. EmaiID and Password doesn't work on tStore, Forums. So it's all very confusing! Can you please try to implement Single Sign On and make it little simple to use. Also I am not able to find any of the accessories like case, screen guard etc for this phone on Flipkart, Amazon or EBay. Any Pointers Please? Is anyone listening here? Multiple calls to customer care have yielded nothing. Password Reset System on TStore is a piece of joke in 2017. 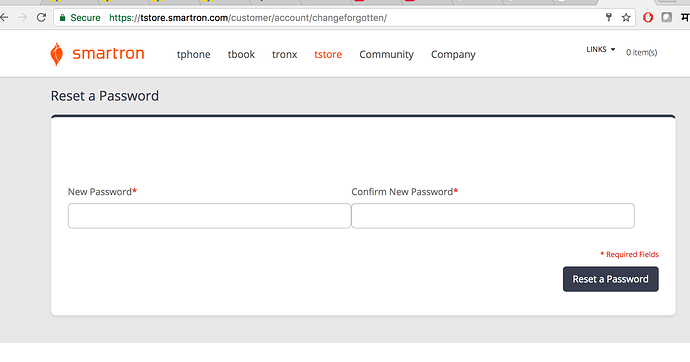 It takes us to a static link and nothing happens when you try to reset password apart from screen refresh. Should we take this to Twitter Account of Sachin Tendulkar? Hi @TechySoul, Let me look into the this if there is any technical glitch in registration process and come back. Be assured of all launch offers. Hi @smartydarren there are two service centers in Mumbai, one in Thane and one in Borivali. Please write to tcare to get details. I purchased srt phone & also I registered with app. As well as forum. you don't need to get anything for extended warranty, tcare system will take care of that. On cover shipment dates, it is as per T&C of the offer. Or email to us at tcare@smartron.com. Will address to the concern immediately. @RohitRathi Thanks Rohit for the response and assurance. BTW the phone is just amazing. There are too many low cost phones available in the market but this one has the perfect balance of great specs and a fluid finely tuned Android OS which is very close to Stock. Kudos to the entire team. Only issue I've found so far is that I can't use fingerprint scanner to turn the display off like most of the android phones out there and the position of the power button just aggravates this limitation. Hi @TechySoul, Let me look into the this if there is any technical glitch in registration process and come back. there was a glitch with one server cluster, which has been resolved, system should be back to normal now. @RohitRathi - No, Issue is still there. I am not able to reset the password and the screen just refreshes and shows the same reset password page instead of any confirmation or error. What about heating issue? Can someone please elaborate because there are loads of YouTube bloggers claiming that the device reaches Upton 48° C.
After going through all reviews on Flipkart and a few videos on youtube, this phone doesn't look balanced. Firstly the battery backup is low.....moreover the phone is all plasticky and to top it heating issues. the price bracket is also high for this phone. One should atleast wait for 6 months and get a feel on how users are reacting to it. the 2 year warranty is just a gimmic. if it fails whats the point of having a warranty of 2 yrs. moreover they are using Sachin as an advertisement to sell this product. Look at the xiaomi, lenovo phones they are balanced in terms of proc, battery etc......remember ASUS had launched a phone last year with great specs and it turned out to be a bad phone.......I've even demoed their T book and comapared to Microsoft Surface I would rate it 1 out of 5....So wait before buying this device. Well thanks for timely reply, but isn't a concern if device is reaching 42 or 43°C. Moreover, how to resolve this heating issue..
Ps, this device is running on stock android an d no bloatwares..
No you're wrong and you're suggestions are highly unacceptable​.. one should use the phone and then give a review.. you cannot assume flipkart and YouTube suggestions. Myself being a noob have raised a few queries regarding the device and users are responding to those..